Randell Cottage Writers Trust celebrated its tenth birthday over three days from October 4-6 with eight of its writers in residence in attendance, and a host of friends and supporters from the literary, French and Wellington communities that support its work. The festivities began with a reception jointly hosted by the Trust, the French Embassy and Wai-te-ata Press. Gnossienne, a limited edition collection of poetry and art by former Randell writer Pat White, and Catherine Day and printed by the Press, was launched on the night. Both the poetry readings and the speeches — in English and French — celebrated the success of the Randell Cottage residency which welcomes a French writer for six months every year, and a NZ writer for six months. The next day, public readings by the eight of the 21 Randell writer in residents were held at the Wai-te-ata Press Printery followed by an afternoon tea hosted by current resident at the Thorndon cottage, Vivienne Plumb. The three-day event ended with a drinks party at outgoing chair, David Underwood’s home where a special birthday book Livre d’Or with writing by the writers who’d lived and worked in the cottage was launched. The new chair, Sarah Dennis, says the Randell Cottage Writers Trust is in good heart and excited about the next ten years. She says one of the best things about the three-day party was seeing a number of the writers return to share their experiences in the cottage and their writing since. It underlined for the Trustees and Friends of Randell Cottage the importance of the residency in the cultural life of two countries, and of the city of Wellington, she says. The 22nd writer in residence from France, Estelle Nollet, was announced by the French Ambassador at the joint reception. 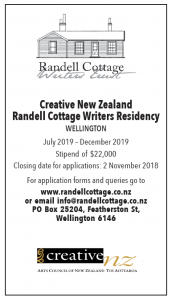 Meanwhile, Randell Cottage Writers Trust is calling for NZ writers to apply for the next NZ residency starting July 2013. Applications close November 2. Go to the Application page for details.